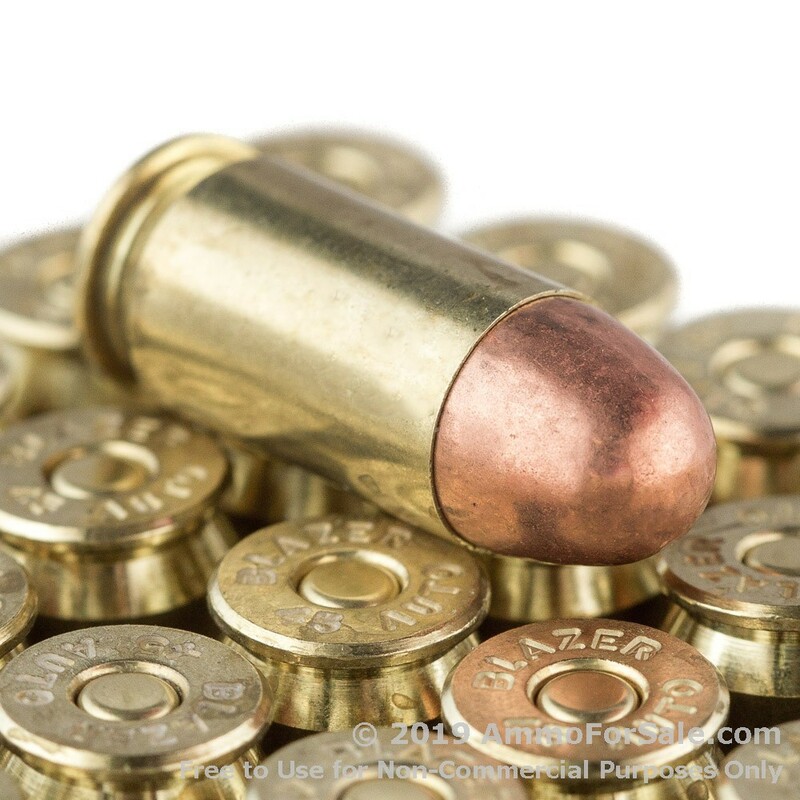 The .45 ACP is considered the most effective combat cartridge when it comes to pistols. It offers a terrific combination of accuracy and one-shot stopping power, and the recoil is not nearly as big as you might think before having tried it. And because it has a fairly low maximum chamber pressure rating at 21,000 psi, service weapons last longer when compared to others. For example, the .40 S&W operates at 35,000 psi and the 10mm at 37,500 psi, pressures that tend to wear a gun out more quickly. In addition it has low flash, which is important in combat scenarios. Your .45 ACP is a compelling gun and it’s made all the more compelling when combined with skill. Increase your skill with practice – and lots of ammunition. 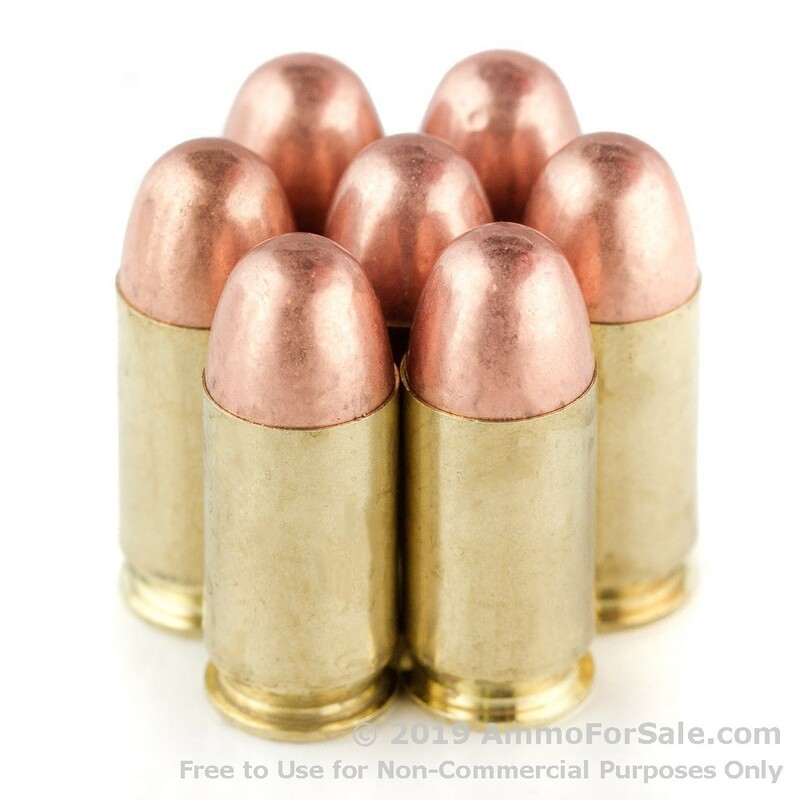 These are heavy rounds at 230 grain and give your .45 ACP added knockdown power. Because they’re FMJ rounds they’re great for target practice, shooting drills, and plinking; nothing is more important than practice, and every time you squeeze the trigger, you’re practicing. Each round rushes to its target with a muzzle velocity of 830 feet per second and makes serious contact with a muzzle energy of 352 foot-pounds. 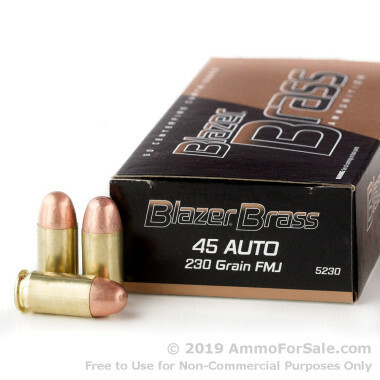 Blazer manufactures these as new-production brass cases with small pistol boxer primers, so they can be reloaded (must be reloaded with small pistol primers), and they’re non-corrosive, so there’s less friction in your gun’s barrel. Blazer ammunition is manufactured by CCI at their plant in Lewiston, Idaho, which is right near the Washington-Idaho border. CCI has been in business for more than 60 years, and those years of experience absolutely show in the quality and performance of their ammunition. Their Blazer Brass line is high-quality and adheres to stringent standards; if you want to give your gun a healthy meal, this is it. Best of all there are 1000 target rounds in this case so you can load mag after mag. After all, what could be better than a day spent heating up your favorite handgun? This top shelf .45acp ammo. I took down a 200 lb pig with one shot at 25 yards. I shot it right through his rib cage and blew out his lungs and heart, great ammo! Good practice ammo,fairly clean shooting! Yes, this is correct. Blazer Brass utilizes small pistol primers in their 45 ACP loads as a way to help keep costs lower for shooters. These 45 ACP casings feature a small pistol primer pocket and are still reloadable using small pistol primers.